Grapes have been pressed on the island of Cyprus for over 5.500 years. By doing so the Cypriots were 1.500 years ahead of most of the Mediterranean countries. In the 8th Century BC the Greek writer Hesiod wrote about a sweet wine made from sun dried grapes. Shakespeare and Richard the Lionheart made references to the Cypriot Nama, a delectable sweet red wine traditionally chosen by the clergy for the sacrament of Holy Communion in Greek Orthodox churches. Homer calls Cyprus ‘Euoinos’ [from εὖ (eû, “well”) + οῖνος, (oenos,“wine”), the ancient Greek word describing the one that produces quality wine. It is believed that the wine-making process was introduced to Greece from Asia. However, the excavations of Cypriot archeologist Porfyrios Dikaios in 1932, brought to light new archaeological findings that overturned this belief. In the area of Erimi (Limassol District), Cypriot wine vases have found. The chemical substances found in them led directly to the conclusion that wine was kept in them. This was the proof that Cyprus was the first country in Europe that produced wine, as these vases date back to 3500 BC. The Roman floor mosaics in the House of Dionysus, in the Archeological Park of Paphos, provide useful evidence of the ancient wine production of Cyprus. The mosaics, dating back to 4th century, depict Dionysus teaching Icarios the art of wine making. On the side of the illustration, one can see two men drop drunk to the ground. The uniqnuess of Cypriot wine was maintained despite the growing competition from the Orient and the Occident. Commandaria is the oldest wine in the world that is still being produced today. 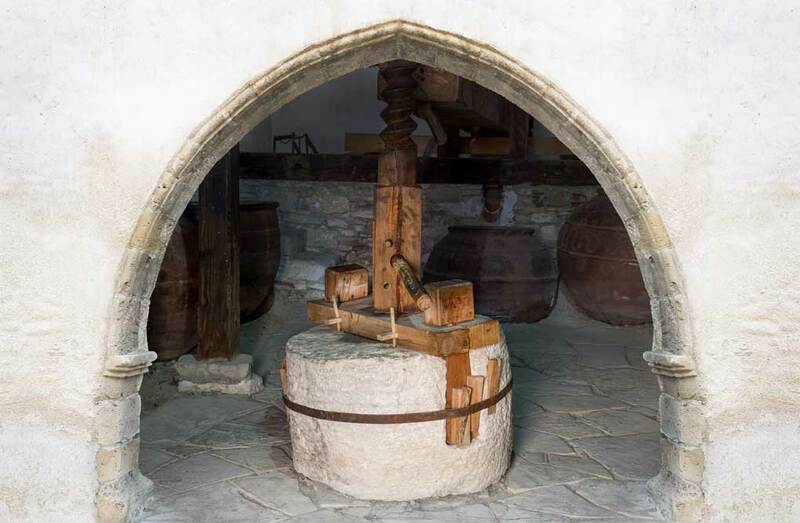 From the past 3.000 years this very special sweet wine has been pressed from dried grapes. There is evidence that its unbroken tradition began around 1100 BC, being even mentioned in Homer writings. However, the Commandaria production did not reach its peak before the Middle Ages, and until Richard the Lionheart conquered Cyprus. The King appreciated the sweet wine of the island and made sure to export it in England, his home country. The Knights Templars, who took control of Cyprus in the same year and, following them, the Knights of the Order of Saint John, subsequently carried its excellent reputation worldwide. In the vineyards of their commandry’s estates, La Grande Commanderie, the Crusaders produced the sought-after Commandaria. Here –and only here- the grapes for this honey-like drink are being cultivated and pressed to this day. Cypriot wine was knighted in the year 1363 during the ‘Banquet of the Five Kings’. The mayor of London then held a reception for Peter I of Cyprus, Edward III of England, David II of Scotland, John II of France and Valdemar IV of Denmark. For the rulers’ toasts Commandaria was served. From this moment on, it became infamous and known as the ‘Wine of the Kings’. However, it is not always an advantage when a good reputation is being carried across the Seven Seas. It is said that Sultan Selim II heard of the legendary wine and adjudged that he alone, the ‘King of Kings’ was entitled to this noble drink. He ordered his mercenaries to set out and conquer the island in 1571. High taxes and wine prohibition during the 300 years of Ottoman rule resulted largely in the demise of the art of wine making by the Cypriot cellarers. Only when the British took over the island in 1878 the wine production accelerated again. The reason for the rebirth of the Cypriot wine making was owed to a major setback for its European competitors – the phylloxera (vine pest). Cyprus was spared from this and, therefore, was able to boost its exports. Unfortunately, in the following decades more quantity than quality was the outcome. The greatest Cypriot wine exports at the time were sherry for Britain and cheap wine for the former Eastern Bloc countries. Today, the Cypriot wine is undergoing a surprising renaissance, that begun in the 1980s and is still rapidly develops. Today’s wineries have evolved and created with a new philosophy, and competence. In the new generation of Cypriot wines one can find the perfect combination of tradition and a keenness to experiment. The ‘young’ wine producers are professionals and amateurs, lateral entrants and ambitious winegrowers, old hands and novices. And they all have one thing in common: they are looking to bring an age-old craft into the modern era.